What is the CGT Cap? The CGT cap for superannuation contributions is a lifetime contributions cap for some contributions relating to the small business CGT concessions. 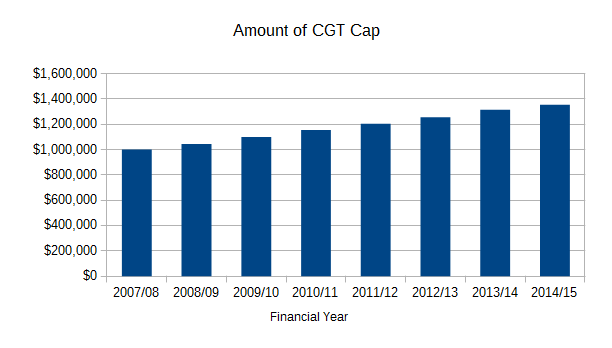 The CGT cap is a lifetime cap – an opposed to the annual contribution caps, however it is indexed and these indexed amounts increase a persons lifetime cap. For example, say a member had used $ 1,100,000 of their cap in the 2009/10 financial year – the full amount of their cap. When the cap indexed for the next year their remaining lifetime CGT cap would have increased to $ 55,000, due to the indexation. The CGT cap is important as it exempts amounts from the non-concessional contributions cap. Amounts contributed as part of the small business CGT concessions could exceed the amount of non-concessional contributions under the three-year bring forward rule, and would otherwise trigger the excess contributions rules. Although this could still occur if the amount was over the CGT cap. In order to apply the CGT cap to one of these amounts a form needs to be lodged with the ATO. The operation of the CGT cap is governed by s292.100 of the ITAA 97, with the amount of the cap determined and initially set by s292.105, though indexed in accordance with subdivision 960 M.
How much is the CGT cap? For the 2014/15 financial year the CGT cap is $ 1,355,000, per the ATO. However each member would have their own cap based if they had any prior CGT cap contributions. The CGT rules are complicated, even more so when considering the Small Business exemptions, with many conditions needing to be met – expert advice would be required on the details and timing of any particular transaction.